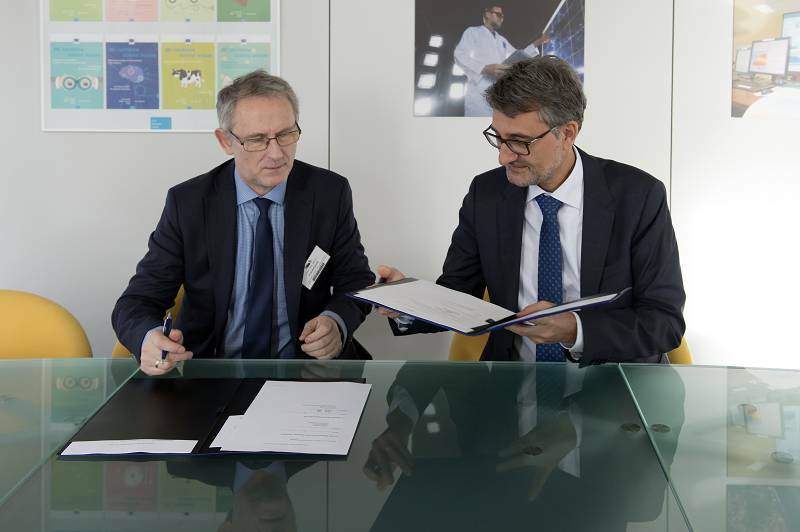 NCBJ has reached an agreement on collaboration with Joint Research Centre (JRC), one of the Directorates General within the European Commission. Scientists employed in JRC six research centres and the Brussels-located headquarter carry out research to provide European Commission, European Parliament, Council of the European Union, and EU Member States with an independent advice and support to EU science & technology policy. Heads of the six JRC research centres have recently visited Świerk. Within the framework of the agreement, NCBJ scientists will be co-authoring JRC research programmes and that way will participate in coordinating EU science & technology policy, in particular in such fields as development of nuclear technologies for power generation and other industry sectors, cyber-crime security, medical applications of ionizing radiation. „The NCBJ-JRC collaboration agreement reflects a high position of our scientists at the international level and the role of our Institute in shaping EU science & technology policy” – said Dr. Krzysztof Kurek, NCBJ Director General – „The agreement has opened up some new possibilities, including some opportunities within the Horizon 2020 programme. Development and implementation of new radiopharmaceuticals is an excellent example of specific area for the collaboration. Fast and precise diagnosis followed by effective disease treatment have always been among key challenges in medicine. Our scientists have achieved numerous successes in that field and we are going to intensify development of nuclear technologies applicable in people healthcare”. Nuclear medicine is just one of the specific areas for the collaboration. Material research, safety of nuclear facilities, radiation protection, education and training activities are other identified areas. These topics were discussed by EU experts who recently visited Świerk. Our scientists have presented research potential of the MARIA nuclear research reactor, the POLATOM Radiopharmaceutical Centre, and the CIS Świerk Computer Centre. MARIA is among a few reactors in the world routinely used to produce molybdenum, radioactive isotope used in 80% of all nuclear medicine procedures performed in the world. POLATOM is a global supplier of radiopharmaceuticals exporting them to 80 countries all over the world, including USA, Japan, China, Russia. CIS is heavily involved in conducting safety analyses of nuclear reactors. The recent visit of some EU experts in Świerk was a working meeting organized to identify detailed areas of the planned NCBJ-JRC collaboration and possible joint research projects. The agreement was signed on February 2, 2017 in Brussels. JRC was represented by Vladimir Sucha, JRC Director General, and Andrea Bucalossi, Head of the JRC International Collaboration Division. NCBJ was represented by Dr. Krzysztof Kurek, NCBJ Director General, and Dr. Jacek Gajewski, NCBJ Coordinator for International Projects. Dr. Zygmunt Krasiński, Director of the Warsaw-based National Contact Point for Research Programmes of the UE was also present.